We are so confident you will love your ENJO products that if you are not completely satisfied with your ENJO purchase or if any product does not perform as claimed, or is damaged / faulty, ENJO will replace the product or refund your money, for a period of up to 30 days (one month) after purchase. If the option of a refund is selected original freight costs will not be refunded. For all refund and replacement queries please call 1800 222 508 and our friendly Customer Care team will assist you with any questions and provide you with a returns form. The returns form must be completed and returned with the goods. Return postage and handling costs will be covered by ENJO when shipped within Australia. Alternatively, please contact your personal ENJOpreneur who will be able to assist you with all your queries. Please refer to your email sent on order confirmation which outlines your personal ENJOpreneur contact details. These details are also located in the My Account section on www.enjo.com.au. When you receive your parcel, you will find enclosed your purchase, and a packing slip outlining your purchased items. If you wish to return an item, it must be returned with the Tax Invoice which is emailed after completion of purchase, and all Returns Information filled out on the form supplied by ENJO or your personal ENJOpreneur. Exchanges are only available for products of an equal dollar value. Please note if you purchased your items using Afterpay the following conditions apply. If you wish to return your goods, complete the online returns process as per the normal returns policy by contacting our Friendly Customer Care team on 1800 222 508. If eligible for a refund, your partial payment/payments will be adjusted accordingly and the appropriate amount, if applicable, will be refunded to you direct by Afterpay. Afterpay will process the refund immediately; this may take up to 48 hours for the bank to refund the money back into your account. 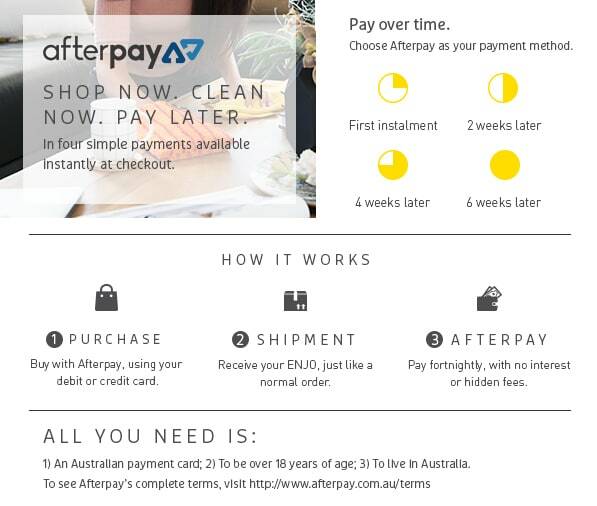 For further information please refer to the FAQs on Afterpay. Please note if you purchased your items using zipPay the following conditions apply. If you wish to return your goods, complete the online returns process as per the normal returns policy by contacting our Friendly Customer Care team on 1800 222 508. If eligible for a refund, your partial payment/payments will be adjusted accordingly and the appropriate amount, if applicable, will be refunded to you direct by zipPay. Once a refund has been processed, the refunded amount will appear in your Zip account within 48 hours. The funds will then be put towards any balance currently owing on your account. If the refund amount puts your account into credit - or if you've overpaid your account and would like the funds returned to you - please contact zipPay Customer Care team to arrange this. Alternatively, you can choose to leave your account in credit and use the funds for your next purchase. Please note, when a refund is applied to your account, the refund amount will not include any fees you may have been charged while paying off your purchase (e.g. monthly account fees or late payment fees). For further information please refer to the FAQs on zipPay. All ENJO cleaning fibres have a six month warranty against faulty workmanship. All ENJO Hardware including the Floorcleaner, Window Cleaner 20cm and 32cm and Flexi have a twelve month against faulty workmanship. All other ENJO products including and not limited to: T-Towels, Spray Bottle, Bags and any other promotional items have a three month warranty against faulty workmanship. All products are only covered when used for their intended purpose and cared for in the way prescribed in the Care Instructions Card included with your order or at www.enjo.com.au. Please keep your Invoice as proof of purchase is required to make a claim. For all warranty queries please call 1800 222 508 and our friendly Customer Care team will assist you with any questions and provide you with a returns form. The returns form must be completed and returned with the goods. Return postage and handling costs will be covered by ENJO when shipped within Australia.